GLOUCESTER — You can thank me later, but first let me share the exciting news. There are two Capes in Massachusetts! Who knew? Scrub that look of disbelief off your face and listen carefully. Not only is there Cape Cod, but there is something north of Boston called Cape Ann. I’m still in disbelief over my discovery. I felt like Leif Erikson in a Volkswagen Golf as I sped toward the Annisquam River and into this new Promised Land. Fine, I wasn’t the first to discover Cape Ann and Gloucester; it was that show-off Mark Wahlberg who discovered it. But let’s forget semantics and get to the meat of the matter. As a Bostonian who returns to Cape Cod every year like a molting swallow to San Capistrano, Gloucester was off my radar. I’ve lived in Boston for 25 years and can count the number of times I’ve been to Gloucester on two little piggies. 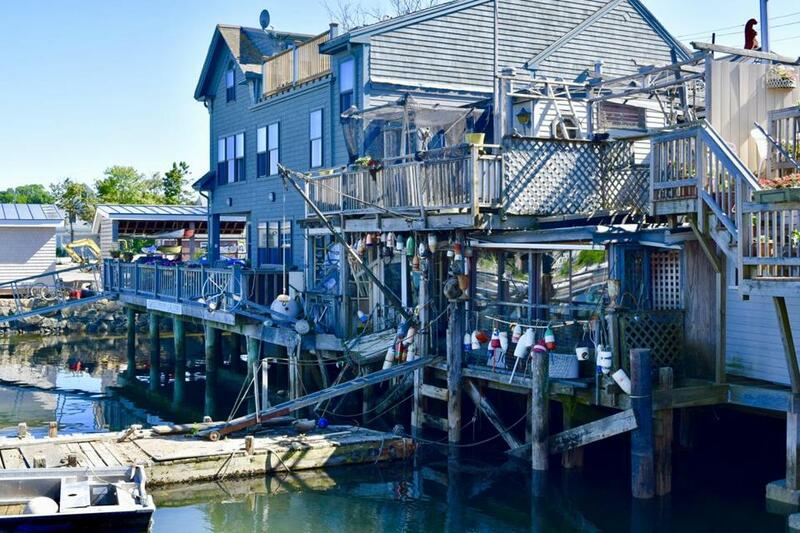 Perhaps I never thought of Gloucester as a proper beach town because of “The Perfect Storm,” or from what I’ve heard about the reality show “Wicked Tuna.” Can I be honest with you? I wouldn’t know “Wicked Tuna” from Charlie Tuna. But one afternoon when I was walking with a friend through the Rocky Neck Art Colony (so sweet, so charming), she became animated when she spotted a boat called Hot Tuna. I assumed it belonged to the 1970s blues-rock band of the same name. But it’s the property of TJ Ott, a hirsute fisherman from “Wicked Tuna.” We strolled over to say hello, and I chatted with Ott’s extremely pleasant parents. What a town. I found celebrities, amazing seafood, beautiful beaches, and culture. Classic shingles in the Rocky Neck Art Colony. I challenge Sebastian Junger to find the kinds of gems that I did during my time in Gloucester. Did Junger linger over a St. Germaine cocktail at the beautiful Beauport Hotel when he spent time in Gloucester? I can guarantee he did not, primarily because the hotel only recently opened. However, I did linger over said cocktail. In fact, in the name of research, I lingered over two of them. Enough about my discoveries. It’s time to get to the itinerary of how to spend a perfect weekend in Gloucester. First, a disclaimer: This is a Gloucester weekend for beginners. I’m approaching the city for those who are woefully misinformed. Meaning myself. There is plenty of sand available at Half Moon Beach. Go to the beach: One of the few downsides of this Cape is that water temperatures can stay frigid longer into the season. The good news is that small children generally don’t care if they get frostbite in the ocean, so pack up your ankle biters and go to the beach. Parking for the popular Good Harbor Beach and Wingaersheek Beach can be pricey ($25 during the week, $30 on weekends), but they are gorgeous and have nice facilities. I was a fan of Half Moon Beach, where parking is $10 during the week, and $15 on weekends. It’s located in Stage Fort Park, so you can head up the hill to the grassy area and have a picnic if you prefer your turkey sandwiches without sand in them. There is a shuttle that runs from Stage Fort Park to downtown Gloucester, Good Harbor Beach, Niles Beach, and Rocky Neck Art Colony. 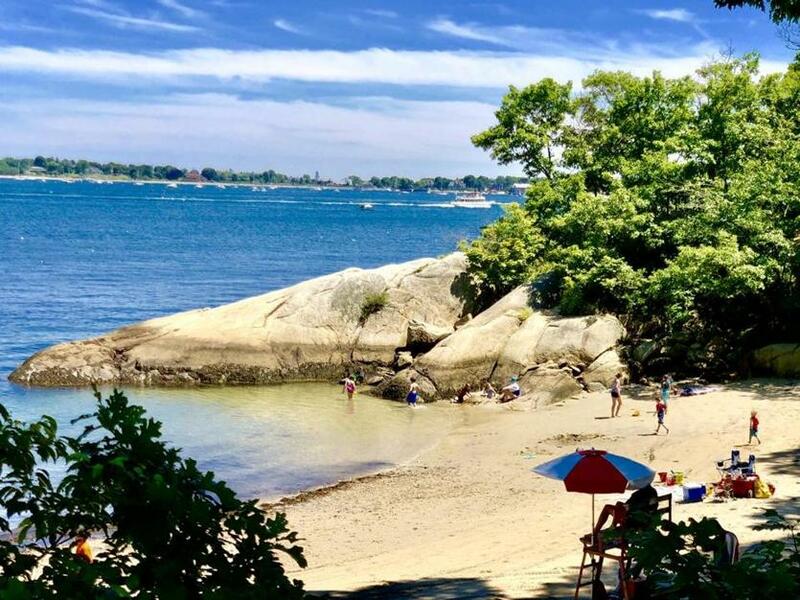 Resident parking stickers are required for Plum Cove and Niles Beach, but there’s no rule that prohibits nonresidents from simply going to the beach. There are lots of hidden beaches, but I was sworn to secrecy by locals not to reveal them. Culture: The Gloucester Stage Company is a great place to spend an evening. It’s a professional theater that is currently running Sam Shepard’s “True West” through Sept. 8. You should also devote a night to splaying yourself on a sofa at the Cape Ann Community Cinema and enjoying a glass of wine and a film. Pro tip: Sit on the leather sofas and other materials that can easily be wiped down. The beautiful Cape Ann Museum should rank high on your list of rainy day activities. For you Cape Ann newbies, the area was once thick with artists (and still is), and much of their work is on display here. Make sure to see the current Harrison Cady exhibition before it closes Oct. 28. 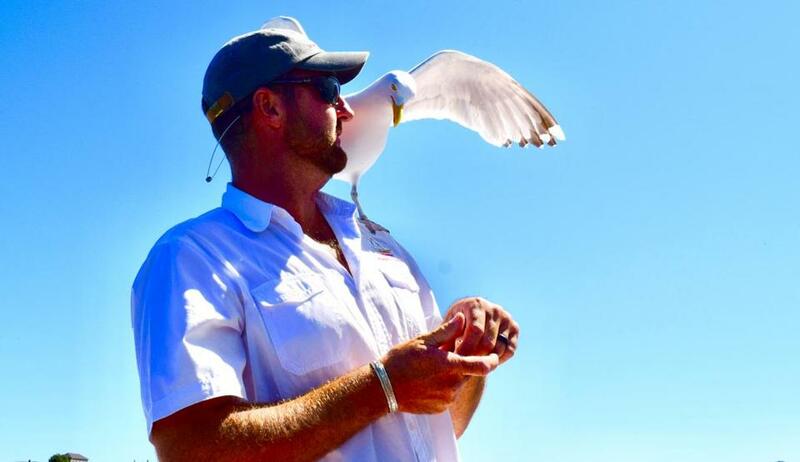 A friendly seagull on the Schooner Thomas E. Lannon. Nature: A good way to understand the geography of the area is to look at it from the water. I took a two-hour tour on the Schooner Thomas E. Lannon which gives views of Ten Pound Island lighthouse and the slightly wacky Hammond Castle Museum. If you’ve been squeezing your nickels and your vacation fund is flush, I’d recommend a room at the Beauport Hotel. It’s a stunning new property on the water. There’s a rooftop pool, a beautiful lobby, complimentary bikes, and it’s stylish as heck. Summer weekends are not cheap (expect to shell out upwards of $500-plus a night). I had not been squeezing nickels hard enough, so I opted for the Ocean House Hotel at Bass Rocks. It’s not located downtown, but it is located on the water and I had an exceptional view from my room. I still paid over $250 a night, but it’s summer, and it’s a beach town, and that’s what happens in New England. 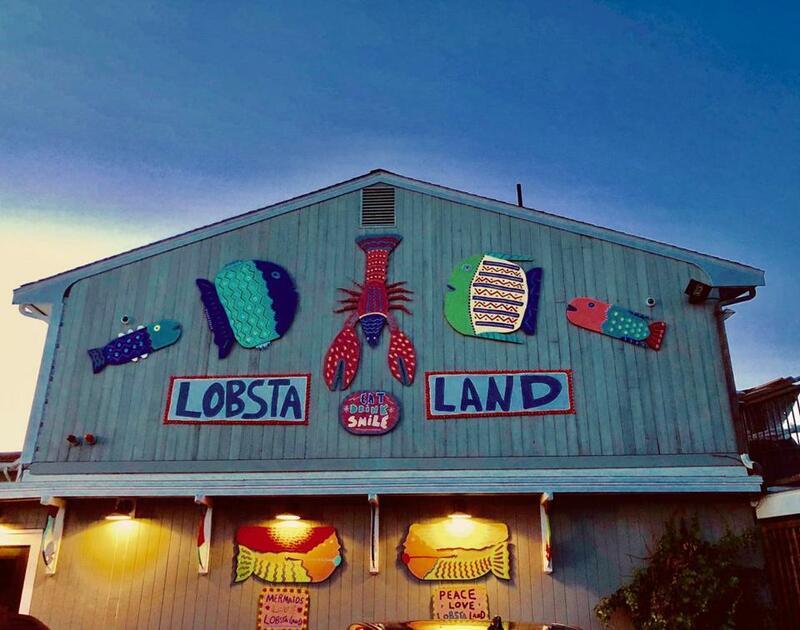 On a warm summer night, tables are hard to come by at Lobsta Land in Gloucester. It’s next to impossible to narrow down food options in Gloucester. I watched six loaves of fresh bread come out of the oven and get placed on the windowsill to cool at Zeke’s Place. My pancakes were fantastic and the owner even told a table of misbehaving children to straighten-up. My kind of place. But my breakfast was also amazing at Willow Rest. At Lobsta Land, I sat alongside sunburned, smiling families as I ate my fish and chips while I befriended a bubbly waitress named Noelle. I know people don’t travel to Gloucester for the sushi, but it’s worth seeking out at Latitude 43. My Gloucester regret was that I was unable to secure a reservation at Duckworth’s Bistrot. It’s Gloucester’s latest and greatest, and I hear the banana cake is extraordinary. Beth Williams created a pair of glass earrings in her Gloucester studio. I spent a good two hours at Mystery Train Records. It has an astounding selection. I walked away with Nat King Cole’s “Cole Español” and, please don’t judge, Culture Club’s “Kissing to be Clever.” There are plenty of T-shirt shops. The kind of places that the highfalutin among you would call honky-tonk. 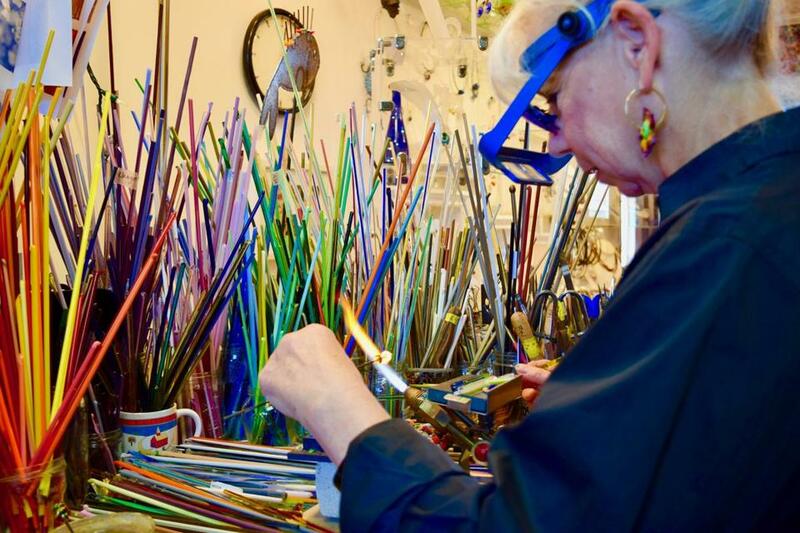 I stumbled into Beth Williams Studio, and when I started chatting her up, Williams broke out the blowtorch and gave me a demonstration of how she makes her glass baubles.